The forever weirdly named Nissan Qashqai has been receiving a large boost in power for awhile thanks to it's brand new GTR drivetrain. Earlier this year Andrew showed off this car when it was first taking shape. Now it's done and crazier then ever. The weird little CUV is the second in Nissan's stable of odd choices to drop the fabled GTR drivetrain into. The first was a black ops project by some Nissan engineers that decided to put it in the Juke, and by george did they create some buzz. What&apos;s The Most Insane Economy Car Ever Built? 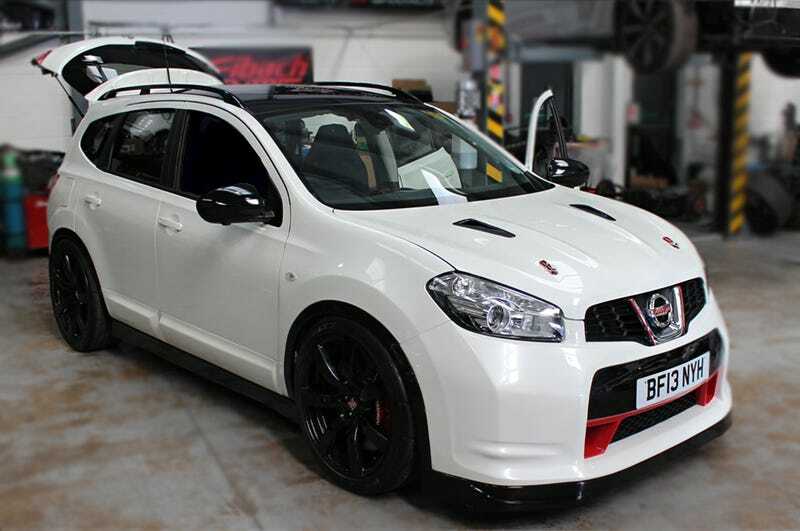 The developers of this little monstrosity are a tuning company called Severnvalley Motorsport or SVM. But underwhelmed by the Juke R's 600hp that preceded their Qashqai, they decided they wanted to build a hypercar killer. So this thing, because no other adjective describes this car better than thing, was given 1100hp! They are tentatively calling it the the Qashqai R to go with the Juke R's nomenclature, but I feel like it should be renamed the Nissan Certain Death, because that's what you are going to get if you put the power down on this frightening savage. 0-60 is 2.7s which is faster than almost every new hypercar, like the 918, P1, and LaFerrari. And to add insult to injury, the Qashqai will go on to a top speed of over 200mph, supposedly, they just need to find someone mad enough to strap themselves in. What's even crazier is that you can actually purchase this car with real money. It's not something cooked up in Gran Turismo, or Forza, where the laws of physics don't apply when stuffing monster engines in small things, but you can have your very own Qashqai R for the low low sum of half a million dollars! You can find me here on Twitter talking about how to swim in Jello.